Almost every mobile phone, including smart wearables, possesses capabilities to track one’s movement. There has however been no clever way of using this data to provide clues about people’s movements. The companies have held on to it and have done nothing. The users have simply been pleased with themselves for reaching their daily goals and moved on to the next day. A mobile app, Human, an all-day activity and calorie tracker that inspires you to move 30 minutes or more every day, has just mapped the total duration for human activities in 30 cities. Human an iOS app, runs in the background and automatically detects activities like walking, cycling, running, and motorized transport. The app visualized 7.5-million miles of activity in the 30 cities for its insights. The data is fascinating, both if one is interested in how people move in cities and for town planners. From the data, town planners can be in the know about what infrastructure people prefer and build to cater for that. The data is also reflective of the capabilities of cities in allowing people to move in different modes. Though the data, by the mere fact that the app is only iOS and that people do not always have their mobile phones on them, cannot be a conclusive study of movement in cities, however it does offer a glimpse of how people move in cities. Human ranked cities in categories. The categories are the most active cities, (moving by doing walks, runs, or bicycle rides), cycling cities, walking cities, running cities and car cities. Amsterdam is the most active and cycling city, Washington is the most walking city, Berlin the most running city, and Los Angeles the most car city. Amsterdam, understandably so, is last on car cities, and Los Angeles the last in most active, cycling, and walking. The only African city featured on the data is Cape Town. 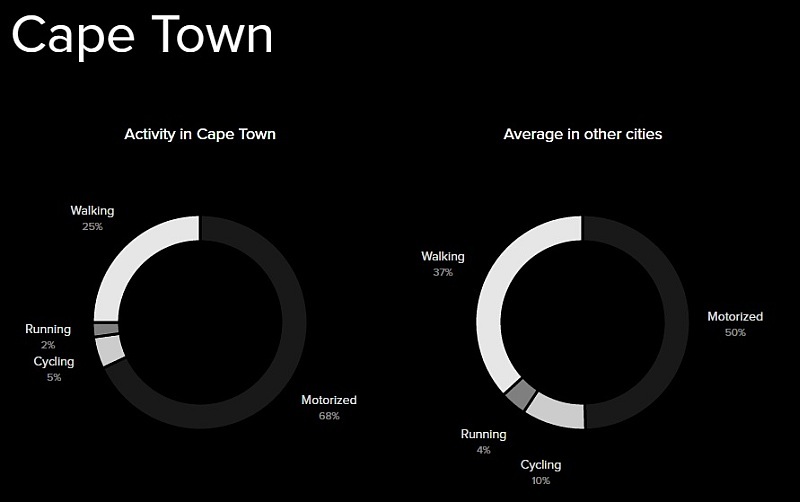 The data shows that Capetonians do not walk or cycle much. Driving accounts for 68% of all activity in the city, walking 25%, cycling is five percent, and running is even lower, at two percent. The data also reveals a fair amount about a city’s infrastructure, allowing for extrapolations around how much a city restricts people’s movements and how much it allow them. If a city does not have expansive accommodation on its transport infrastructure for instance then that city’s bicycle data will be low. The same goes for walking, running, and motorised movements. Amsterdam ranks high because it is a bicycle friendly city. What would be interesting to see is how the data, when the app comes to Android, giving a much wider people access to it, changes and what reading it would offer about people’s movements.